Matthieu Chedid, one of the greatest French author-composer-interprets of his generation, better know as "-M-", comes back to London with a concert to celebrate the release of his new album, Îl. 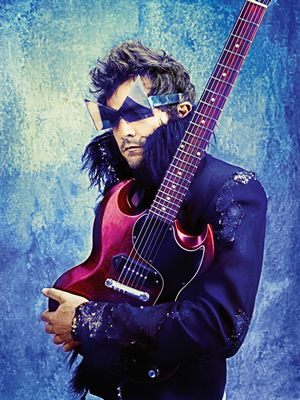 Matthieu Chedid has made his mark as someone who changes his appearance with the release of each new album under the guise of his alter-ego, 'M'. Indeed, he became well-known for his ever-more flamboyant costumes, M-shaped glasses and haircute. Having channelled a psychedelic look for his firtst album, the birth of his daughter Billie prompted him to don bright pink costumes in a bid to get in touch with his feminine side. This was followed by the more natural and introspective period of his album Mister Mystère. With Îl, Matthieu Chedid comes back to a very energetic and cheerful aspect of his personality. The album cover, designed by his daughter, portrays –M- with bright yellow M shaped glasses, simple features, and thick black hair against a deep blue background. These primary colours and juvenile design reflect his desire to come back to "childhood’s incredible imagination and creative force". Recorded with new musicians, Dorion Fiszel and Brad Thomas Ackley, the album is enthusiastic, wild, and full of the energy he gives to his public on stage. 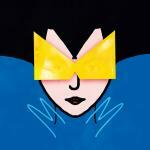 "Îl is a way for me to not take my self too seriously, it's my artistic freedom". The singer plays a lot with words in this album and prefers short words to structured and harmonised lyrics. Whether it is with the titles or the lyrics, writing is the game he loves to play: "When you say "playing with words", everything is said, I want to have fun”. -M- will be in London to transmit to the public his amazing energy on the 4th and the 5th of March. He has "very good memories" of the British capital and he is looking forward to seing the Londoners again, as he particularly loves their "great appreciation of music". "I feel we are going to have lots of fun".